I have recently read two eBooks, Bittersweet by Shauna Niequist and Notes from a Blue Bike by Tsh Oxenrider. Both are available in paper form also, but I got a good deal on them in Kindle format, so I decided to read them that way. I am still totally a paper book acolyte, but I do appreciate having a book or two on my iPad to read. Ebooks are really handy when I am out and about and waiting, don't have wifi access, but would like to use my time somehow. Having a book on my iPad allows me to spend slivers of available time feeding my soul instead of doing nothing or wasting time on mindless games. I've said before that I am not a big fan of self-help books or devotionals. And I much prefer fiction to nonfiction. Yet, I have been reading more nonfiction lately. And I've been enjoying it. I finally figured out why. Just what types of nonfiction do I like? And books that are essentially collections of essays. By this I mean that each chapter pretty much stands on its own. They might all have a common theme, but you can read just one and feel benefited. One chapter does not depend on the previous, per se. These types of book allow me to read and digest in small bites without getting overwhelmed by information or bored out of my gourd. I can peruse whenever I have the time, and it works. Which is why Malcolm Gladwell is one of my favorite nonfiction authors. His chapters are longer, but they all stand enough on their own. They each contain fascinating stories and facts and have a nutshell concept to take away. I love it. Bittersweet and Notes from a Blue Bike were both very much this way. In both books, the chapters ranged from 2-4 pages. Perfect for reading during an oil change or an orthodontist appointment. Their length reminds me of a blog post. Few words, complete thoughts. This isn't necessarily a bad or a good thing. It is simply the reality of social media and books these days. But this also doesn't mean they aren't decent books. I think each is a good read, and something can be gleaned from both. My caveat is that just because every blogger you read may be talking about a book does not mean that it is going to fall into the category of one of your favorite, re-read forever, books. 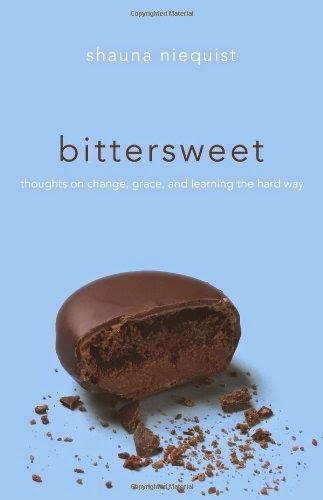 So, Bittersweet was a poignant book about a year or two in Shauna Niequist's life. It was a rough year. But, the foundational concept of the book is that it takes the bitter things of life to remind us of the sweet things. It was a story of pain and loss, redemption and healing. It was real and sometimes raw. It didn't actually have a happy ending. As a matter of fact, if I hadn't read her later book, Bread and Wine, I'd probably think her life kind of stunk. Regardless, I think her point of the beauty in the broken, the sweet in the bitter, came through. I know I have found that to be true in my own life. I loved her references to Grand Rapids. I know the places she mentions. I've been there. I can picture her in my town. It was a neat side line. 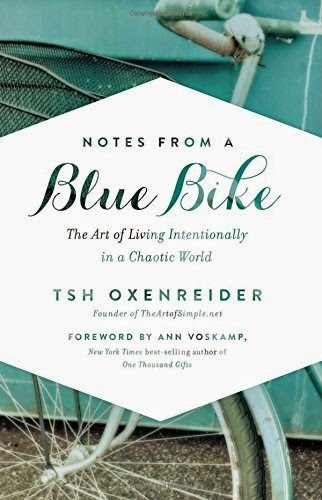 Notes from a Blue Bike is somewhat of a memoir. Tsh writes about living simply and intentionally in our world that embraces busyness and stuff. She writes about technology, travel, schooling, eating, houses and stuff. My favorite section was on travel, because I have the same philosophy. I'd rather travel and see the world than use my money to buy a huge house and a fancy car. My least favorite section was about food. It leaned a bit towards preachy and I just don't care that much where my food comes from. If you enjoy Tsh's blog, Art of Simple, you will probably enjoy this book, because you are already striving for a simpler life style. I must insert that this is not really a how-to book. It doesn't really give tips for how to live more simply. It is more an account of what they have chosen to do.